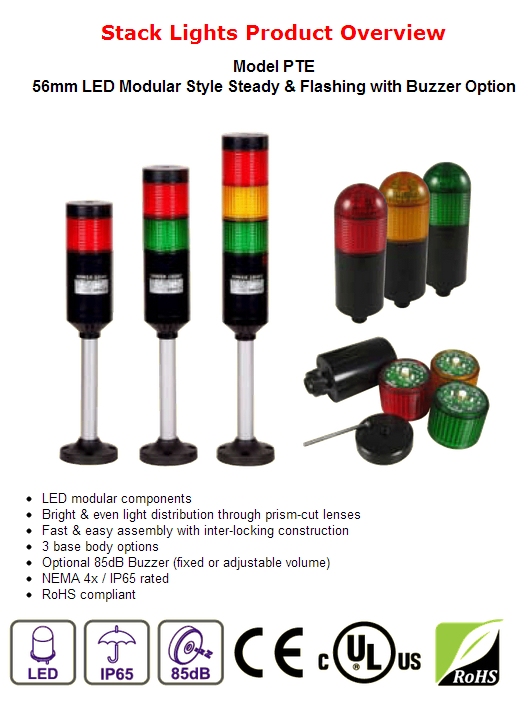 Safety Devices - Beacon Distributors Inc. 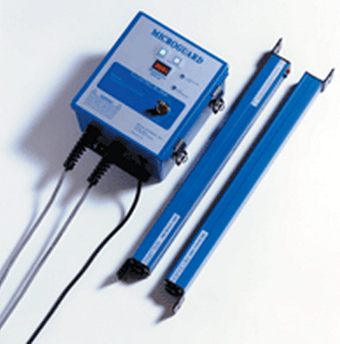 The Model SS is an infrared safety light curtain that is designed to the IEC 61496 standard. When properly installed, it protects the machine operator by passing an invisible infrared light beam across an area to be guarded and examining whether or not the light beam(s) are blocked. If the light beam(s) are blocked, monitored solid state outputs will open, issuing a “STOP” command to the machines normally closed (N.C.) “STOP” circuit. The System is composed of a transmitting unit (EMITTER), and a receiving unit (RECEIVER). The entire system is control reliable Category 4 (per IEC 61496). A single fault anywhere within the Model SS will not prevent at least one of the solid state outputs from opening up, (allowing a “STOP” command) when either a beam is broken or an internal fault occurs. 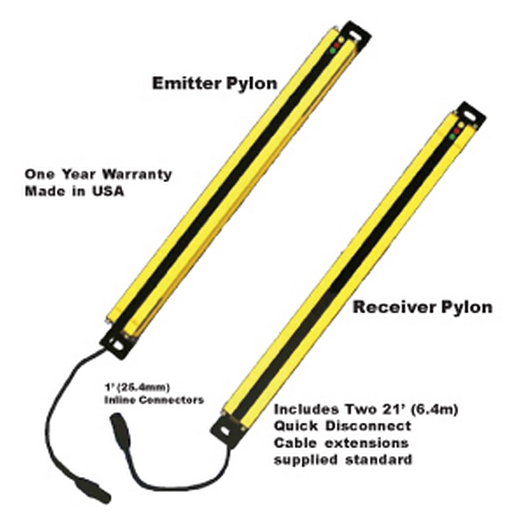 The Model CE is an infrared safety light curtain that is designed to the IEC 61496 standard. When properly installed, it protects the machine operator by passing an invisible infrared light beam across an area to be guarded and examining whether or not the light beam(s) are blocked. If the light beam(s) are blocked, monitored solid state outputs will open, issuing a “STOP” command to the machines normally closed (N.C.) “STOP” circuit. The System is composed of a transmitting unit (EMITTER), and a receiving unit (RECEIVER). The entire system is control reliable Category 4 (per IEC EN 954-1). A single fault anywhere within the Model CE will not prevent at least one of the solid state outputs from opening up, (allowing a “STOP” command) when either a beam is broken or an internal fault occurs. 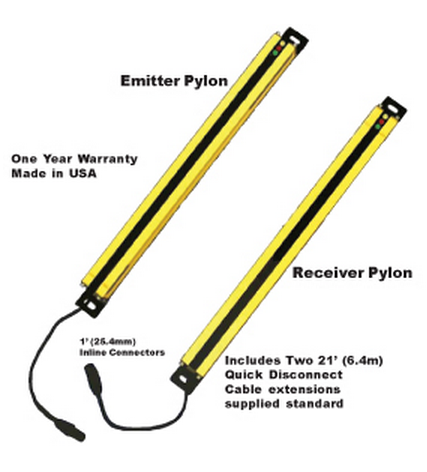 Cascading safety light curtains provide the user the ability to connect additional sets of light curtains by daisy chaining multiple emitters and receivers together. The interconnecting cables are factory supplied and the user defines length. 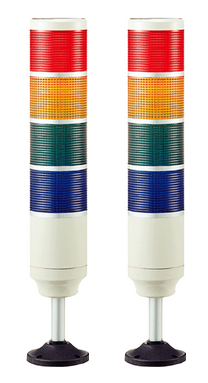 The cascading of safety light curtains provides mulitple areas of guarding in any plane (X, Y, Z), while utilizing the control reliable dual safety outputs from the Category 4 safety device for the safety outputs to the machine control. The ability to guard multiple areas on irregular shaped machines by cascading safety light curtains reduces wiring and provides a lower cost yet effective machine guarding solution. The Model CA Cascading Safety Light Curtain is an infrared safety light curtain that is designed to the IEC 61496 standard. When properly installed, it protects the machine operator by passing an invisible infrared light beam across an area to be guarded and examining whether or not the light beam(s) are blocked. If the light beam(s) are blocked, monitored solid state outputs will open, issuing a “STOP” command to the machines normally closed (N.C.) “STOP” circuit. The CA System is composed of transmitting units (EMITTERS), and receiving unit (RECEIVERS). The entire system is control reliable Category 4 (per IEC 61496). A single fault anywhere within the Model CA will not prevent at least one of the solid state outputs from opening up, (allowing a “STOP” command) when either a beam is broken or an internal fault occurs. The GKM Series Global Miniature Safety Key Interlock Switch is designed for use on machinery where key removal brings the machine to an immediate safe condition. The GKM Series provides enhanced operator safety when added to hinged or sliding guard doors, screens and protective covers on enclosures. Key sold separately. The GKN Series safety interlock switches provide superior reliability in a compact, cost-effective package size. The GKE Series safety key-operated switch provides superior reliability for safety hard guarding applications in a compact, cost-effective package. The GKE conforms to IEC 60947-5-1 and carries the cULus, CE, and CCC approvals. The GKS product marks a significant new product class for your Total Safety Solution. Our switching expertise has been applied to a cost-effective, trapped key safety interlock switch. This product allows OEMs to hold a door or gate closed while a hazard still exists. The GK Series Dual Entry Key Operated Safety Interlock Switch is designed for use on machinery where key removal brings the machine to an immediate safe condition. It provides enhanced operator safety when added to hinged or sliding guard doors, screens and protective covers on enclosures. Key sold separately. The GKR/GKL Series Dual Entry Solenoid Key Operated Safety Interlock Switch is designed for use on machinery where instant stop and access to the machinery is either impossible (due to the momentum of the machine) or impractical (due to tool or machine damage or scrapped product if the current machine cycle is interrupted). The switch incorporates a manual override feature that allows removal of the key for emergency access. Key sold separately. The GSS Series has standard mounting and characteristics that are globally available and accepted. The welded NC contacts will separate (vital security in safety applications). It provides a range of actuation methods for detecting conditions in guarding and machine status applications. Also, this switch is suitable for inductive switching and safety relay interfaces. The 1CPS Cable Pull Safety Switch is intended for use in applications with the cable runs up to 76 m [250 ft], such as conveyor runs within defined system zones. 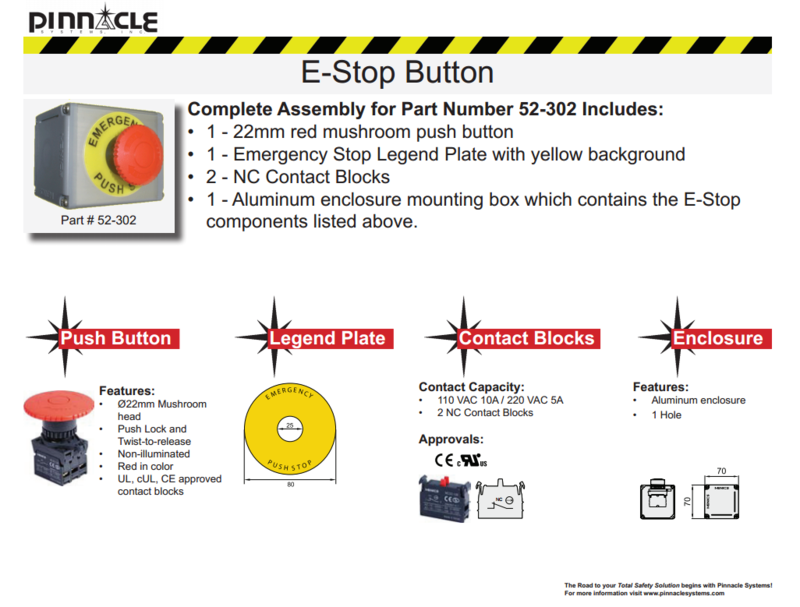 It is a cost-effective means of providing this emergency stop signal compared to multiple emergency stop push buttons. The FF3 is an 30 mm barrel (thread) mounting, magnetically actuated safety switch with up to two safety contacts and one indicator contact. The barrel, thread, mount design is easy to install to the frame of a machine guard and allows for flush mounting, reducing potential switch damage and space constraint issues. Sealed to IP67 enabling use in most harsh environments. Honeywell FF5 switches are magnetically operated, non-contact safety switches designed for use in many machine-guarding applications. The FF5 is available in both ABS and 316 grade stainless steel and is capable of switching up to 300 mA at 24 Vdc. 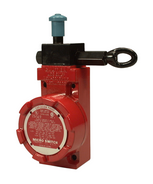 The switch and actuator are fully sealed and can often be used in wet or dusty environments. With correct installation, the FF5 safety switches comply with the guidelines given in EN1088. Honeywell FF6 switches are magnetically operated, non-contact safety switches designed for use in many machine guarding applications. The FF6 is available in both ABS and 316 grade stainless steel. The switch and actuator are fully sealed to IP67 and can often be used in wet or dusty environments. 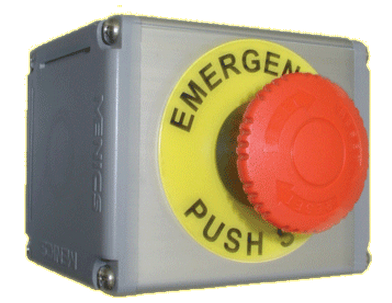 With the correct installation, FF6 safety switches comply with the guidelines given in EN1088. Honeywell Sensing and Control MICRO SWITCH™ GSX Series Explosion-Proof Safety Switches combine the world-class MICRO SWITCH™ global safety switch (GSS) with our superior explosion-proof housing from our LSX and BX product lines, offering our customers the best of our engineering expertise. The positive break feature is designed to provide a safe failure mode, ensuring the machine will not start, and therefore supporting a safer work environment. The GSX Series switch platform allows for over 10,000 actuator and switch combinations, enabling customers to source most of their safety and explosion-proof switch requirements to a single, global supplier. The CLSX Series Cable Pull Safety Limit Switch is designed to provide emergency stop protection for conveyor lines in hazardous atmospheres. The CLSX Series withstands the pressure of an internal explosion and cools the exploding gases below the kindling temperature of the explosive atmosphere. Flame paths are provided by the cover housing threads and an extended plunger between the switch cavity and head.